It takes great skill to keep on coming up with new steel grades and to fabricate them into made-to-measure heavy plates in an unparalleled variety of sizes and thicknesses. This is what makes Dillinger the world leader in terms of heavy steel plate quality and technology. This leading position is founded on its provision of integrated competence in steel under one roof. From steelmaking right through to ready-for-installation high-end products, research, development, steel and rolling mills as well as Dillinger’s state-of-the-art plate fabrication facility all go hand in hand. Such a tightly geared value chain guarantees product solutions that precisely meet the challenging demands of the customer and – thanks to their outstanding efficiency, reliability and service-life – perform convincingly, even under extreme operating conditions. Dillinger’s more than 330 years of accumulated competence and experience has long since earned the trust of leading companies in the energy branch as well as in the plant engineering and heavy machinery, pressure vessel and steel construction sectors. 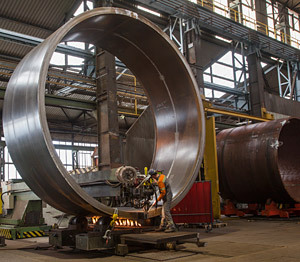 The fabrication facility at the Dillingen location with its capabilities for further processing of heavy plate offers these customers service à la carte. 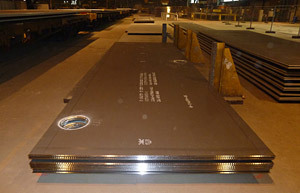 And whether the customer is after a complete package or a one-off service – if the demand is for “bigger”, “heavier”, “more precise”, “more innovative” or “more efficient” than conventional solutions, the Heavy Fabrication Division represents a significant advantage of partnership with Europe’s leading heavy steel plate manufacturer. A business unit from the very start in one of the world’s oldest integrated steel mills, the Heavy Fabrication Division has a unique range of experience. Since its foundation in 1685, Dillinger has constantly expanded its competence across the whole production chain, from steelmaking right through to further processing of heavy steel plate. Today, the Group boasts an annual production output of about two million tonnes of heavy plate in an unparalleled variety of thicknesses and sizes, and in unmatched metallurgical quality. No wonder, then, that this manufacturer is the preferred supplier worldwide for heavy-duty constructions in key industries. The Dillingen location’s share in this output is about 1.4 million tonnes a year. Many of the plates manufactured there are also processed in the fabrication facility – some of them even directly as ready-to-install components with thicknesses of up to 430 millimetres. As Dillinger’s application-oriented spearhead, the Heavy Fabrication Division is a much sought-after partner for the development and realisation of solutions that already meet tomorrow’s demands today. In close collaboration with the customer – and supported by the bundled metallurgical know-how of the steel mill – it consistently achieves excellence in plate fabrication. Its success in this field is founded on continuous further development of processes and production technologies, and also on investment into even more efficient capital equipment. Through its integrated approach to the customer’s needs – covering everything from metallurgical concept and steel process route through to fabrication – it keeps on opening up new and often previously unimaginable possibilities. 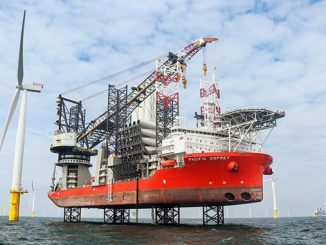 One example of this technological pioneering is Dillinger’s response to a challenging customer request for over 210-millimetre-thick racks for the sort of jack-up rigs that are deployed in the offshore sector. Through systematic development, Dillinger succeeded in proving – with an attained thickness of 230 millimetres – not only that this challenge could indeed be met in terms of metallurgical factors, but also that this sophisticated product could be manufactured and fabricated in Dillingen to extremely narrow tolerances and with veritable surgical precision using thermal cutting. The Heavy Fabrication Division’s capacity to handle extremely large component dimensions and item weights and to provide innovative manufacturing processes as well as complex welded and formed parts makes it a reliable problem solver for particularly demanding requirements. Its support is just as sought after when limits of production capacity in the customer’s supply chain are reached as it is in the development of new potential applications that the heavy plate customer’s own capacities cannot (yet) handle. Companies exclusively focused on installation operations benefit from the integrated fabrication facility at the steel mill, which offers them made-to-measure complete deliveries from a single source. Dillinger’s Heavy Fabrication Division is also the partner of choice for customers dealing with extreme plate dimensions that they cannot further process with their own plant capacities. One of the inestimable advantages for them is the direct access to Dillinger’s heavy plate production. Fabrication can then take place immediately without the transportation problems that such customers would otherwise inevitably have to deal with. Dillinger’s welding technology team is at hand for complex flame-cut parts as well as for custom preparation of weld edges. 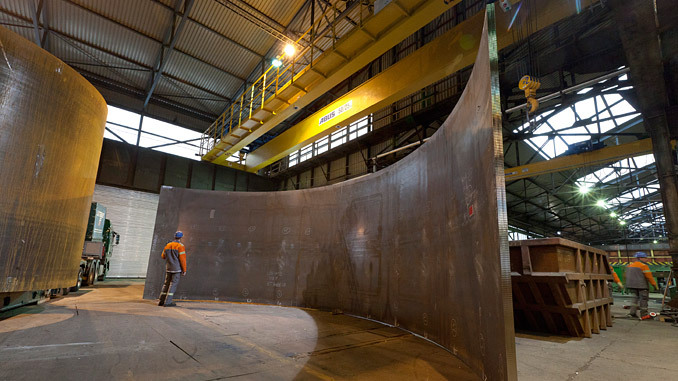 The fact that sophisticated steel grades with thicknesses of up to 430 millimetres and item weights of up to 45 tonnes can be fabricated in Dillingen shows that the facility here is definitely fit for the future. Even if weld preparation calls for flame-cutting or edge machining to an angular accuracy of 0.5 degrees and tolerances of ±1 millimetre over the full length of a 25,000-millimetre-long plate – just-in-time supply of edge-processed and coded components ensures that Dillinger’s Heavy Fabrication Division is a perfectly geared stage in the value chain of, for example, customers in the offshore wind industry. One of the core pieces of equipment in Dillinger’s forming technology is a four-roll plate bending machine which delivers a force of 86 MN for the forming of shell plates in a very wide range of dimensions. The machine is capable of cold forming shell sections up to 4,300 millimetres cylindrical length from a 250-millimetre-thick plate – dimensions that most other providers would have to resort to hot forming to achieve. The plate bending machine also excels when it comes to smaller diameters or high-strength steel grades. In the production of shaped and pressed parts, Dillinger sets standards with high-performance forming units, specially developed production technology and custom-built tools. Hot formed heads with wall thicknesses of up to 220 millimetres or diameters over four metres meet the highest demands for dimensional and geometrical accuracy and are therefore a showpiece discipline of Dillinger’s Heavy Fabrication Division. 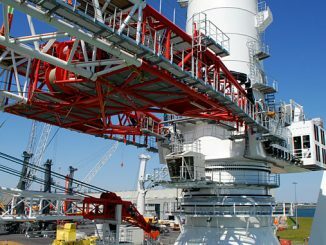 Further impressive examples of its leading position are the hot formed quenched and tempered chords up to 130 millimetres thick and 4,550 millimetres long that are supplied in combination with metallurgically identical racks for the offshore industry. 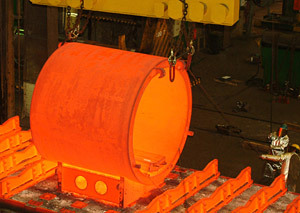 Leading-edge welding and forming technology along with a range of additional services like contract annealing, trial fit-ups, non-destructive tests – on request also mechanical treatment, shot blasting and primer coating – all qualify Dillinger’s Heavy Fabrication Division as the premier address. 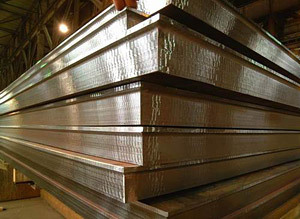 For customised production of critical components made of heavy steel plate for plant and machine construction, the petrochemical industry or pressure vessel construction, the identical metallurgical properties of application-specifically produced plates and components from a single source provide an added guarantee of reliability and precision. With bespoke full-service support like this, and Dillinger’s bundled high-level competence in steel, customers can rest assured that, with the Heavy Fabrication Division, they are always in the best of hands. Patrick Regnery is the General Manager Heavy Fabrication Division at Dillinger.